The Dell PowerEdge T410 server will accept up to two (2) Intel Xeon 5600 series processors. 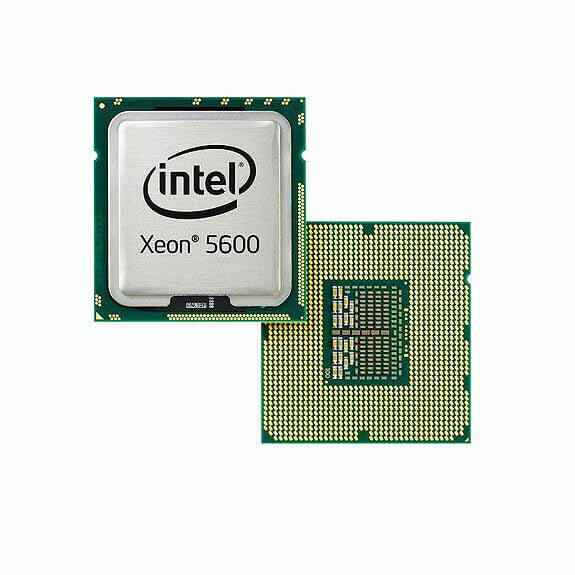 Designed for industry-leading performance and maximum energy efficiency, the Intel Xeon processor 5600 sequence delivers versatile one-way and two-way 64-bit multi-core servers and workstations that are ideally suited for a wide range of infrastructure, cloud, high-density, and high-performance computing (HPC) applications. The Intel Xeon processor 5600 series automatically regulates power consumption and intelligently adjusts server performance according to application demand, maximizing both energy cost savings and performance. Based on new 32nm Intel microarchitecture, the Intel Xeon processor 5600 series reduces energy cost over single-core servers by automatically shifting the CPU and memory into the lowest available power state, while intelligently adjusting performance to application needs. In addition, built-in hardware-assisted virtualization technology gives you the power and flexibility to virtualize different generations of Intel Xeon processor-based servers within the same virtualization pool, giving you the ability to migrate workloads to fewer servers at night to save energy. Selective processors in the Intel Xeon 5600 series also support Turbo Mode. Turbo Mode is an OS-controlled operation that automatically allows the processor to run faster than the marked frequency if the processor is operating below power, temperature, and current limits. *The PowerEdge T410 does not support Intel Xeon 5600 series 130W CPUs.